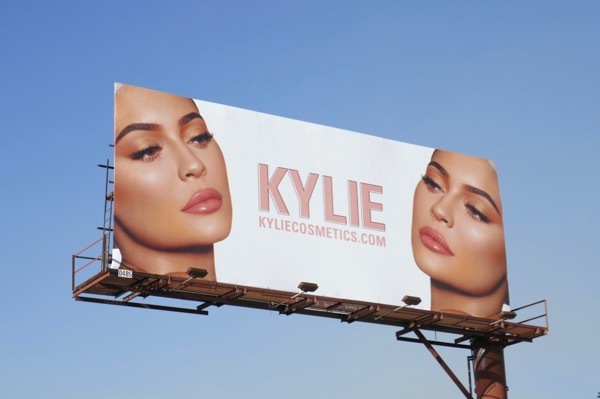 Just because she doesn't get enough publicity, we thought today we'd shine a spotlight on Kylie Jenner and get her one step closer to becoming a billionaire thanks to her youthful Kylie Cosmetics product line. It's bananas to think that lip fillers, being a part of the Kardashian reality television empire and having a dedicated Instagram following of millions can make you so rich, so young. 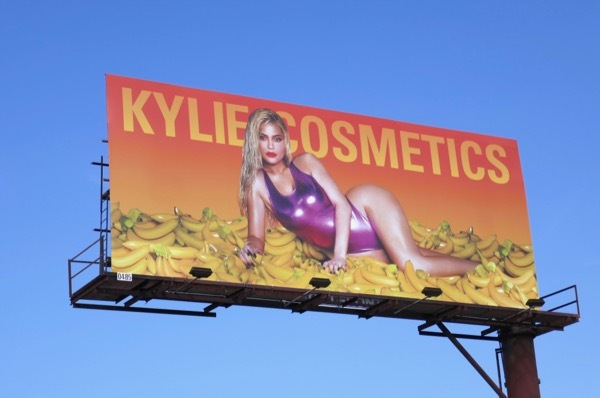 This vibrant new billboard with the makeup mogul atop a bed of bananas was snapped this year on July 11, whilst the previous lippy ad creative was photographed in the same Santa Monica Boulevard location in West Hollywood on May 28, 2018. With parents like Caitlyn and Kris Jenner it was obvious the social media star would find herself in the spotlight and she's certainly worked the family connections, including a recent collaboration with older half sister Kourtney Kardashian in this Kourt X Kylie billboard from April 28, 2018. 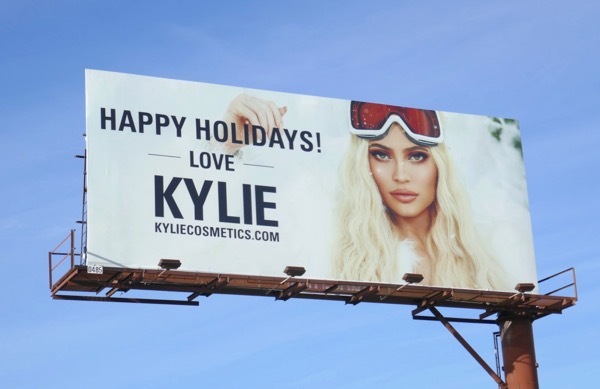 Her face and lips have been a constant presence in the city skyline with this pink Kylie Cosmetics billboard snapped on January 21, 2018, this 'Happy Holidays' billboard spied on November 20, 2017 and running through the festive season. 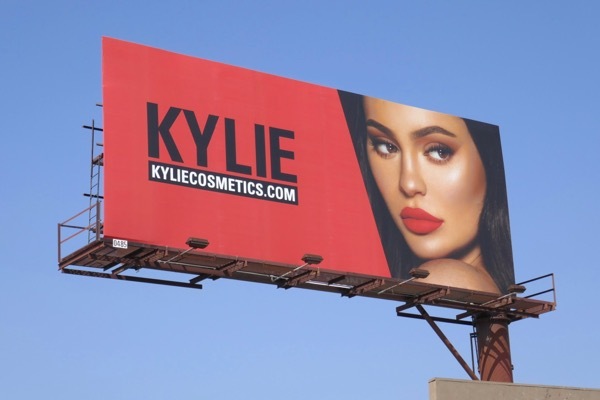 Even when the skies were not so clear her beaming face was modeling her products like with this billboard from September 22, 2017, the cosmetic brand's popularity fueled by the limited number of products she and Seed Beauty makes for each product launch. Leveraging her celebrity more, she even received her own E! 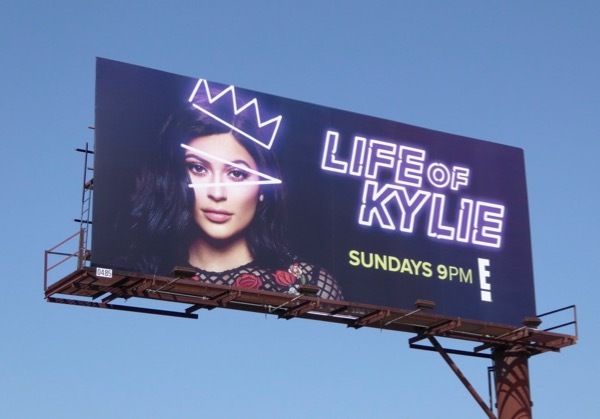 cable channel reality show about her day-to-day life and running her burgeoning business empire, and this Life of Kylie series launch billboard was photographed on August 11, 2017. 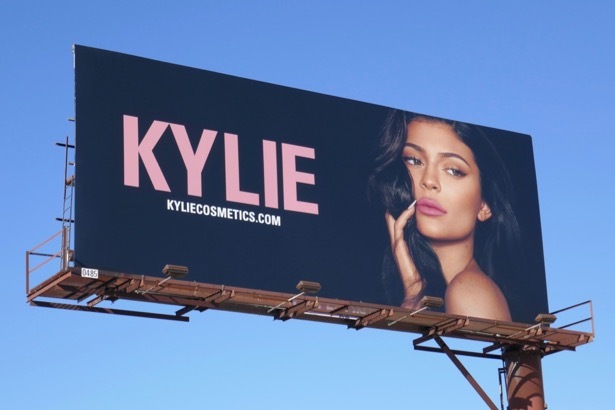 And it's not just cosmetics that help swell her bank account, but also merchandise sold through her online store the Kylie Shop as advertised on this revealing billboard from April 29, 2017, and before that billboard was this pouty illustrated ad creative spied on February 23, 2017. 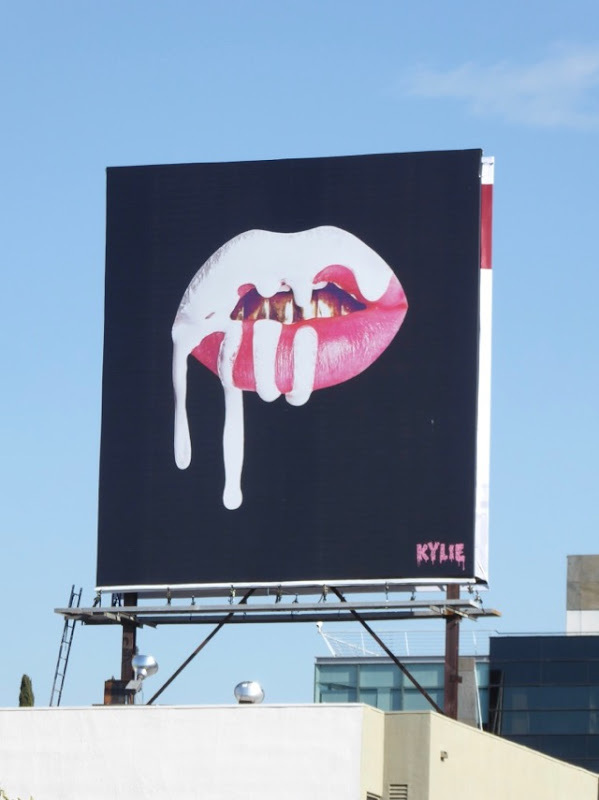 And finally these 'lips' billboards came after the success of her Lip Kits that started it all and immediately sold out back in November 2015. The landscape billboard was snapped along Santa Monica Boulevard on January 21, 2017, whilst the messy homage to The Rocky Horror Picture Show was spotted above Beverly Boulevard on January 14, 2017. Hmmm, when you're a multi-millionaire by the time you're twenty what possibly comes next. UPDATED: Here's also a new billboard for Kylie's pop up store at Westfield Century City shopping mall, snapped along Santa Monica Boulevard on July 30, 2018. 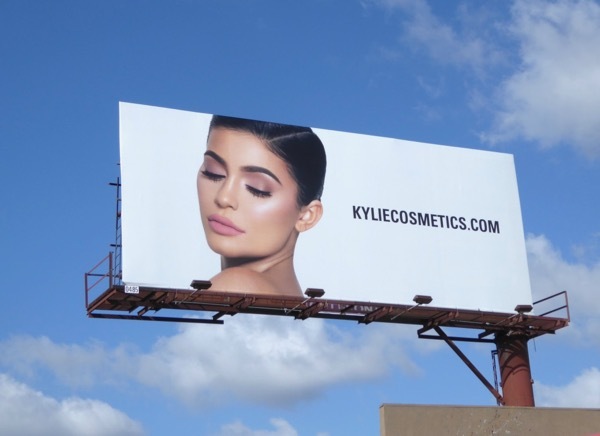 UPDATED: Kylie Jenner continues to give good face with her latest billboard for her cosmetics brand spotted along West Hollywood's Santa Monica Boulevard on August 22, 2018. 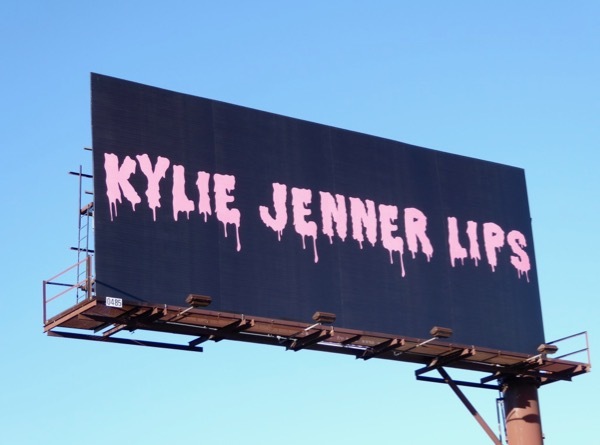 UPDATED: Here's the latest Kylie Cosmetics billboard teasing her collaboration with BFF Jordyn Woods, spied along Santa Monica Boulevard on September 15, 2018. 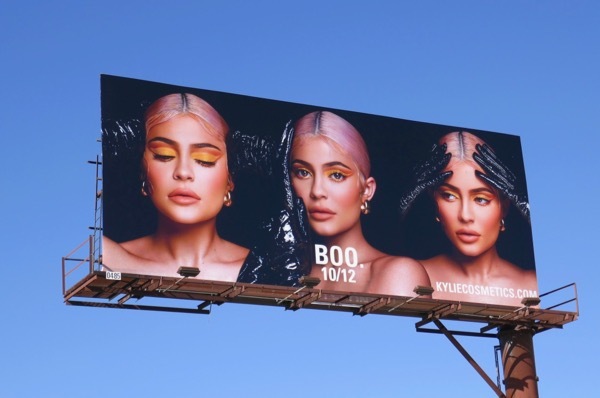 UPDATED: It's looks like Kylie Jenner is getting in the Halloween spirit with her new Boo makeup and this billboard snapped in the same West Hollywood location on October 15, 2018. UPDATED: For her next ad passersby were seeing double with this billboard photographed on November 7, 2018. 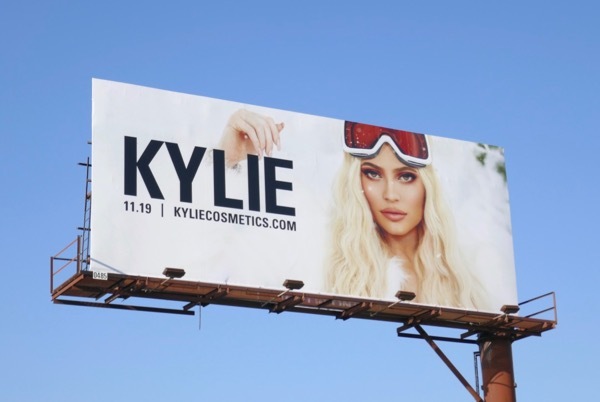 UPDATED: Kylie is back with a third special edition Holiday makeup collection and this wintery ad creative snapped along Santa Monica Boulevard at La Cienega Boulevard on November 20, 2018. 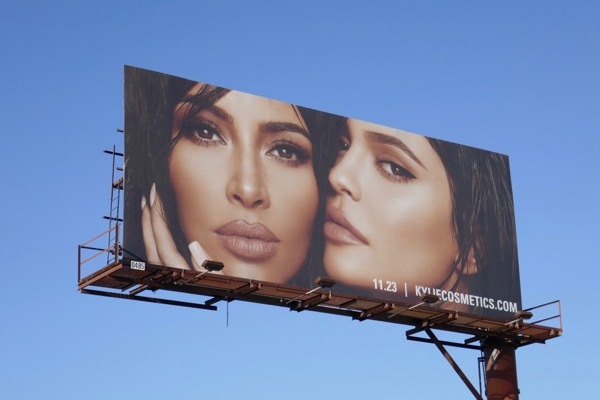 UPDATED: Here's a Black Friday treat, the second makeup collaboration between Kim Kardashian West Beauty and Kylie Jenner Cosmetics and this billboard was captured on November 23, 2018. Ka-ching! UPDATED: She's back on her own and wishing everyone a happy holiday season in this amended wintery billboard snapped on November 30, 2018. 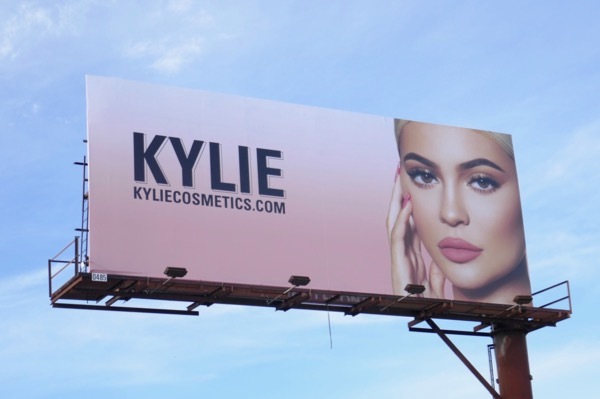 UPDATED: It's a brand New Year and Kylie Cosmetics is back with a fresh new creative snapped in the same West Hollywood ad location on January 13, 2019. 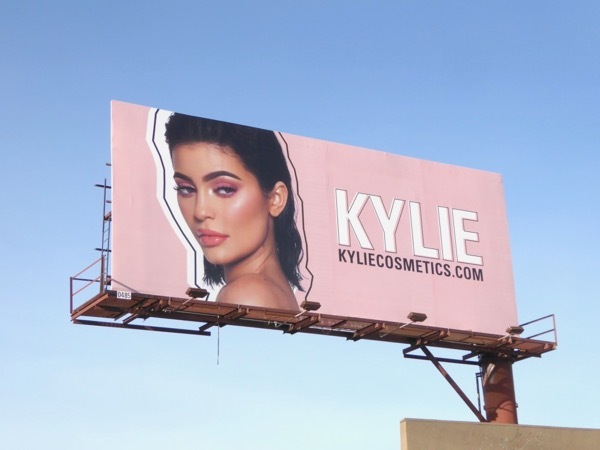 UPDATED: It looks like Kylie Jenner and her cosmetics brand is ready for Valentine's Day with love in the air in this billboard spotted on January 26, 2019. 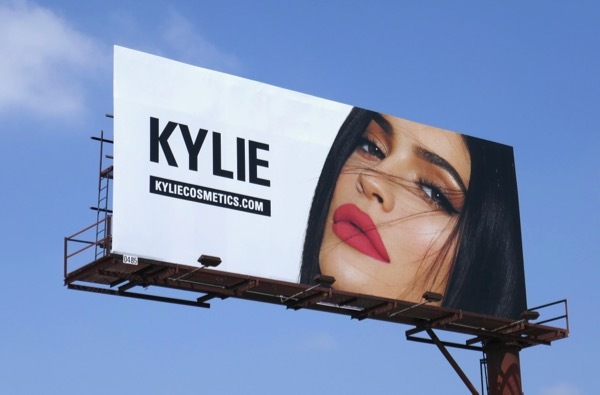 UPDATED: There's no rest for the wicked and and soon as Valentine's Day had been and gone another Kylie Cosmetics ad sprung up and took its place, snapped on February 22, 2019.